Mukhyamantri Nishulk Dava Yojana: Mukhyamantri Nishulk Dava Yojna (MNDY) has been started across the state since 2nd October, 2011 in order to distribute most commonly used drugs free of cost to all patients visiting Govt. Hospital. To run the scheme an advanced inventory management has been developed by the name of e-Aushadhi. Patients profile/ information can also be captured through e-Aushadhi application. 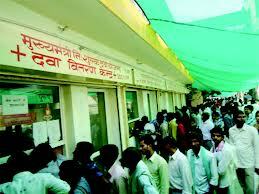 With few changes in the system voucher/ bills can also be issued to the patients. As of now, the inventory management of drugs viz. inward & outward, even at the major sub store like Medical College Hospital, District Hospitals, and Sub Distt. Hospitals, Satellite Hospitals, and also at CHCs, PHCs etc. are being carried out manually. At present, each medical hospital submit indent in off line mode at respective DDW located in each district to procure drugs for their sub stores. These are further made available at DDC for onward dispensing to the patients. Only at SMS Hospital, Jaipur this process is totally computerized for IPD DDC counters. Therefore, in order to manage drug inventory through e-Aushadhi software (one of the modules of Arogya Online Project) at Medical College Hospitals, Distt. Hospitals, Sub District Hospitals, Satellite Hospitals, CHC, PHCs & urban Dispensaries computerization are proposed. Computer Manpower (man with machine) well versed in basic computer application are to be deployed through RMRS, which will help both in inventory management of Drugs and linking of these DDCs to e-Aushadhi application being used by RMSC. Similarly computer hardware, printers, UPS, internet connectivity etc are also required to achieve this objective. DDCs at Medical College Hospitals, District Hospitals, Sub District Hospitals, Satellite Hospitals, CHC are to be computerized. The hospital sub stores at Medical College Hospitals, Distt. Hospitals, Sub District Hospitals, Satellite Hospitals & CHCs are to be computerized. store at this places and no separate computer unit for sub store is provided at these places. DDCs located at sub centers and other places may not be computerized at this stage.